This Keple USB cable can download images from your camera/camcorder to your PC. 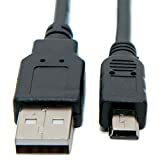 On one end of the cable is a standard USB A male plug that will fit into your computer. On the other end is a Mini USB 5-pin plug which will fit into your camera/camcorder. This Keple product is specifically designed as replacements for the manufacturers original charger. The product comes in a plain, non-retail packaging in order to minimise emissions during transportation. This entry was posted in Discount Photography and tagged Cable, Canon, Data, Digital, Image, IXUS, Keple, Lead, Mini, Photo, Series, Sync, Transfer by Ball Photo. Bookmark the permalink.